If you are a “female” you apparently choose clothing in the form of “outfits,” a sort of ritualized selection process that allows you to look “good” in a different set of clothes each day. While I subscribe to Thoreau’s maxim – “Beware of all enterprises that require new clothes, and, incidentally, when your neighbors come over to your place on Walden and catch a whiff of you, you’ll be even more alone” – it is my understanding that some “ladies” like to change their “clothes” daily and they often need help facilitating this process. But what is a lady to do if she cannot remember what outfits she has worn in the past month? Cry? Yell at the barista? No. She uses Cloth. 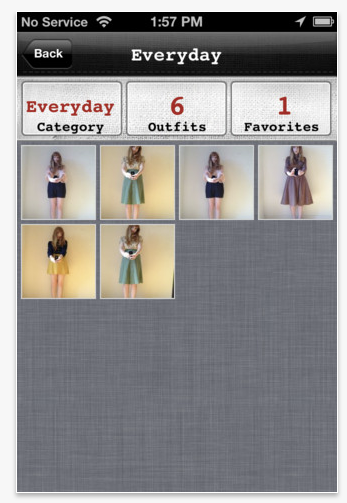 Cloth is an iOS app that lets you store outfits. You can make multiple outfit folders for different events (weddings, work, mall openings), ensuring you never wear the same outfit twice. You can also create ensembles based on various themes, including Holiday, Blood-letting, and Book Signing. You can share outfits with friends or send your outfits to the main Cloth site so the entire world can see how you look (which, I suspect, is the real point here, let’s be honest). The app also includes badges and awards for sharing your outfits. It’s available now and costs $1.99. But, as they say on the TV, you’re worth it. Former TC writer Seth Porges created the app with his model/fashionista/technologist girlfriend Wray Serna. Both Porges and Serna are very well-dressed so I can only assume this will help you be like them. Considering my “outfit” today consists of shorts, flip-flops, and a Goonies baseball jersey, I suspect I could use their assistance.